I think my husband is having the same issues about Pegasus as I am about the guest room, but more so and for good reason. Pegasus is the white mini-van that we have had for...well, years and we got her before I began blogging, but I was keeping a journal at the time. We sold the Panther last week and just got the Pegasus worked on. Tomorrow is the first time we will be driving Pegasus on our Thursday errands. I am actually happier that I will be driving a "beater" and that it is smaller so it is easier handle in parking lots. I need to explain what I did not write in my journal. We had a very nice black high top conversion van, the Panther, that I truly enjoyed, but sometime during the summer when Alan had to go on medical leave for the injury from my aunt's horse, I began feeling a strong urge to become very thrifty. We were living on about 60 percent of regular pay considering there was no overtime. Even though he had been back to work for a couple of months, that urgency only seem to be even stronger, so I suggested that we sell the Panther and get a used mini-van that would be better on mileage as gas prices were high at the time. It was not something I particularly wanted to do, but felt we just had to do. So, we sold the Panther and bought a used 2000 white Dodge mini-van that we named Pegasus and then we realized why God had been urging us to do so. My husband had been working a lot of hours this week, nearly 40 in over time. His boss called today while he was sleeping, but his manager was not his usual self and I felt there was something rather important about the meeting scheduled this morning that my husband had missed--particularly since he did not know what it was about before hand as he usually does. This evening a co-worker brought my husband home because the brakes locked up after he just had them replaced that day. He also had the one and only key to Pegasus because he was going to have another made today, so I could not pick him up even if he had thought of it. After his coworker left, my husband asked if I had a few minutes. Then came the news…Today was his last day at work, economical cutbacks they said. Well, it will be interesting to see how Atlanta runs with just four guys. My husband said they may hire him back, like they did in other cities after firing the experienced personnel, paying them their salaries plus their severance pay at the same time. I have been of the mindset to cut back as far as we could for the last few weeks. The Lord again preparing my heart for what was to come, I believe. The news left me with odd feelings. I truly feel this is part of the Lord's plan for us and this is the last of the entanglements we built up in our life. (Insert: the entanglements were from a vision I kept seeing of angels untangling and clearing away a large pile of bright colored conduits.) Yet, part of me also believes I should be worried and scared; oddly, I find it a bit scary that I am not as concerned as I should be. What my Lord has in store, I am not sure. I am concerned about having only one vehicle. If my husband gets a job without a company car, it could mean some real lifestyle changes. My typical Thursday would be pushed over to the weekend, I suppose. But, I am not sure what we would do for the Princess' piano lessons…? I suppose I could continue teach her piano myself for awhile until we could save enough for another car. Thankfully, we have not yet paid the credit card with the money we got from selling the Panther. We may need it for living expenses or another vehicle. Lord, please let me see clearly the path you have provided for us to walk. God had it all planned out. The money from the Panther not only paid for Pegasus and a few necessary repairs on her but also paid off our remaining 401K loan, which became due in full immediately after he was terminated. We did not see all that coming, but God did! My husband did get a job on the last week of his severance pay, but there was no company vehicle and he was making about the same as he did on medical leave nearly a year before. Since he had to fly to most of weeks, the Princess and I would drive with him to the airport on most Monday mornings and pick him up at the airport most Friday nights. When he worked in town, he had Pegasus except on Thursdays; we continued with piano lessons and errands on that day by dropping him off at the office or at the customer's place of business depending on where he was needed that day. Therefore, Pegasus was our one and only vehicle from December 2007 to February 2011, when my husband started a new job with a different company. At that time we added another white mini-van same model as Pegasus but a 2002 that only had 47,000 miles on it. By the way, it is not that we like white, it is just that these vehicles fit our criteria as to price and mileage, and since my husband had driven this model when he had company cars, we knew they were durable. We hoped to keep Pegasus another year even though she has tipped over 300,000 miles because she has been such a good reliable van, but then his company signed on to the Runzheimer plan: 30 Days or Else. Before we knew about this, Pegasus just had her timing belt and water pump changed, a $700 job, and book price she is probably worth just that up to $1,200 maybe. She has been sitting in our driveway partially because my husband has not been home to try to sell her, not wanting me to handle it myself, and partially because he is having difficulty with the idea of selling her. 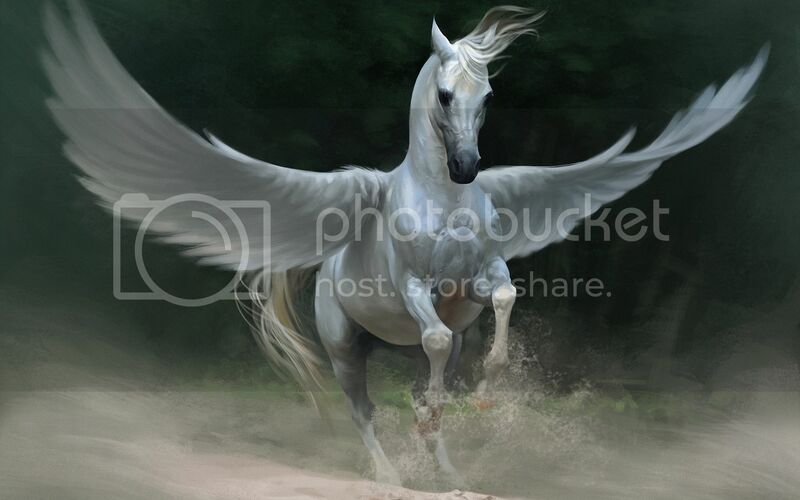 It was not just the eight years, Pegasus has been a symbol to us of how God guided us, protected us, and helped us to prepare and endure some tough years financially. When we watched too many other people around us lose their jobs and then their homes, we were still eeking by. It was not comfortable, but it was doable. There was the time after we had her for over a year that one of her tires literally disintegrated on its sides as my husband and I with our dog were driving back from picking him up at the airport while the Princess was watching a movie at the church. I was so glad this happened with him being there. The treads were not too bad, it just was the tires were old. My husband changed the tire only to have the spare go flat as we got back on the highway. I do not know why he did not go through the intersection to pull into the gas station, but instead he pulled into the closest lit place, a McDonald's, to try to fix the spare and try to fill it with air with our emergency compressor, which was going to taking lots of time, but I was at peace as I was praying about getting back to our daughter. Within a minute or two a red pickup pulled up right next to us. The man had an air compressor in the cab of the truck and between the fix-a-flat and the air, we made it back to the church and then home. My husband was worried about the money for new tires all around and I asked how much it would cost. He seemed relieved when I told him that we had it because I factored into my budget that we would need to have money available for repairs and maintenance. Two weeks later after getting the new tires, we were driving through the remains of a horrible ice storm that blanketed northern Tennessee and on up through all of Ohio. It was not so much that it was slick, but the roads were terribly bumpy from the ice, because it had been too cold for salt to melt the ice completely. We could only go about 45 miles an hour in the best of places to my mother's funeral and it was jarring us all the way. I am so glad we have the new tires before that! We had moments like that all the time. Pegasus has kind of like our rod and our staff that comforted us; she never parted the sea, but through her God always seem to meet our needs before we knew them and she certainly got us wherever we needed to go without a back up vehicle. The thrifty side of me would like to sell her for at least the $700 we just put into her, but nothing anyone would pay for her would come close to what she is worth to us, so far more than her book price. After much consideration and prayer, we decided to donate her to a Christian organization that ministers to children, who should be coming for her this morning; the signed title and keys waiting on the table next to me. It just feels right, but in a bittersweet way. My Lord, I probably do not know all the times You provided for us, but I also know times when it was so obvious to us that You did. Thank you for blessing us with reliable vehicles and taking care of us in preparation for rough times as You have. I ask that You continue to bless our vehicles and us.